When making any cannabis recipe, there is always a decision as to whether or not to use cannabis butter or dried weed. Cannabis butter, or canna butter, has the advantage that it is far easier to apply and put into the recipe as it will substitute as a butter with the cannabis added in. With dried weed, there is the added step of decarboxylating your marijuana in the oven and then applying it into the recipe. This has the added advantage that you get to use your favorite strain of marijuana and that the weed is “fresh”. For this recipe, we have gone with cannabutter for ease of use. Weed biscuits are an all-time favorite among cannabis users and these biscuits can be taken on camping trips or simply eaten at home. There are many weed biscuit recipes online, this one makes use of sweet potato and cannabutter as opposed to others. Heat the oven to 425 degrees Fahrenheit and grease the biscuit sheet. Peel and chop the sweet potato before you boil it. Once it has been boiled in the saucepan, mash it as thoroughly as possible and add the milk to whisk it together. Mix all the dry ingredients together in a bowl (flour, salt, baking flour, sugar). Cut the 6 tablespoons of cannabis butter into small pieces and add to the dry mix. Add the sweet potato mash to this dry bowl and mix it all together. If it is too dry add some milk to the bowl. You now have your mixture. Sprinkle some dry flour onto a worktop and put the dough onto it. Roll out the dough using a rolling pin. Use the biscuit cutter to cut the dough into biscuit sized pieces when it has the desired thickness. 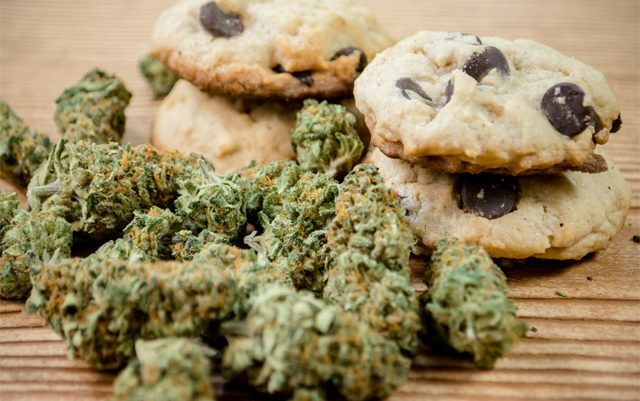 Now your weed cookies are ready to be cooked in the oven. Place them on the biscuit tray and insert into the oven for 15 minutes or so. When they turn a golden brown they are ready to be taken out, and this tip applies to many other weed recipes and dough based recipes in general. You now have a delicious and somewhat nutritious weed biscuit using sweet potato that takes less than 25 minutes to make.